February is a novel set after the oil rig Ocean Ranger sank in a violent storm 300 km off the coast of Newfoundland on February 15th, 1982. Cal O’Mara is a fictional victim of the rig sinking. February follows his widow Helen as she raises their four children and as the shape of her grief evolves from the sharp, stabbing pain and shock of sudden loss into the ache of long-term absence over the ensuing 25 years. Moore’s is a distinct voice. Devoid of dialogue, she uses ordinary yet evocative language that’s spare, yet rich in description. I read Caught last fall, and fell immediately into Moore’s cadence, reminiscent of the gentle lilt of of a Newfoundland accent. This book does an amazing job of exploring grief through Helen’s eyes without ever devolving into the maudlin. Cal appears in the book only through Helen’s memories of their wedding night and their first ten years of marriage, so many of which are the ordinary stuff of a simple, loving, domestic existence — the struggles to raise three children born in quick succession, pleasures like found kites and paperback books read in companionable silence. Even though you never meet him first-hand, Moore’s brilliance is that Cal isn’t a tragic figure — he’s fully formed and as a reader you can’t help but empathize with the magnitude of Helen’s loss. Highly recommended and worth your time. We have grown apart, she thought. She’d gone on without him. She would have sat next to him and peeled the apple and she would have felt like his mother. The dead are not individuals, she thought. They are all the same. That’s what made it so very hard to stay in love with them. Like men who enter prison and are stripped of their worldly possessions, clothes, jewellery, the dead were stripped of who they were. Nothing ever happened to them, they did not change or grow, but they didn’t stay the same either. They are not the same as they were when they were alive, Helen thought. The act of being dead, if you could call it an act, made them very hard to love. They’d lost the capacity to surprise. You needed a strong memory to love the dead, and it was not her fault that she was failing. She was trying. But no memory was that strong. This was what she knew now: no memory was that strong. The present is always dissolving into the past, he realized long ago. The present dissolves. It gets used up. The past is virulent and ravenous and everything can be devoured in a matter of seconds. That’s the enigma of the present. The past has already infiltrated it; the past has set up camp, deployed soldiers with toothbrushes to scrub away all of the now, and the more you think about it, the faster everything dissolves. There is no present. There was no present. Or, another way to think about it: your life could go on without you. The poor young waitress behind the bar — she tried so hard to look like there was nothing strange about Helen. She tried to look like she had never in her life heard of loneliness or decay or rot or maggots or something slower and less dignified, this middle-aged need to touch someone. This is what Helen has learned: it is possible to be so tired you cannot reach for the sky, you cannot breathe. You can’t even talk. You can’t pick up the phone. You can’t do a dish or dance or cook or do up your own zipper. The children make such a racket. They slam around. They play music on bust or they lie on the couch watching soap operas. They fight and smash things and lose their virginity or they lose their way. They need money and they need to borrow the car. One shoe is always missing. You go through the bookbags, you go through the closet; always one shoe. Gone. How foolish his parents were to love like that. How foolish to have so many children. They had no money. He wants to ask his mother, What were you thinking? Didn’t you know what you were getting into? Why did you love each other so very much? It destroyed you. Don’t give that much, he wants to say. People don’t have to give that much. How foolish to keep going. She’d gone into the glass booth of the station to pay and the young man behind the counter was reading Anna Karenina and he turned the book over on the counter regretfully. She saw the big Russian saga drain out of his eyes as he took her in. Helen and the smell of gasoline and a freezing gust of wind. The slack, alcoholic features of his face winched tight to one corner, one eye crinkled shut, in an effort to keep his cigarette tilted up out of the way. 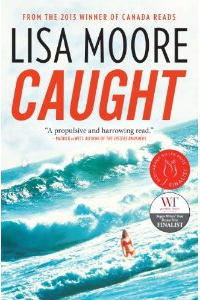 Caught was short listed for the 2013 Giller Prize. It’s the story of a young Newfoundlander, David Slaney, who escapes from prison on the eve of his birthday to attempt a do-over of the crime that got him “caught” (incarcerated) in the first place: smuggling massive amounts of pot into Canada by boat. I loved this book, not so much for the plot, but for Slaney as a character who is complex, thoughtful, and reflective. Patterson, the cop who hunts him, is equally well rendered — vivid portraits of twin protagonists, one “good,” one “bad” on opposite sides of the law. 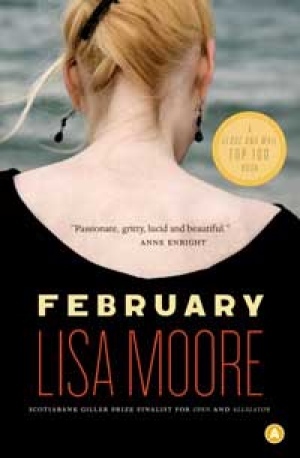 Moore’s language is clipped yet lyrical, dense yet economical. The cadence of the prose is like an incantation, casting a spell that evokes the details of the working poor in Canada in the 70s, the strippers, truckers, barkeeps, veterans, students, huge families, and the mentally ill trying to live their lives. I read the book twice, back to back, and I’d read it again. He had spoken with the authority of a man who had suffered. He was a broken sort of man, Slaney decided. He had been broken not by something big, but the grinding of a thousand small things to which he himself had agreed. He had made concessions.